I taught Peanut this material by demonstration. And, as you’ll notice, spindle boxes are separated into two sections. One section is for 0-4, and the other for 5-9. I invited him to try 0-4 first. In my case, he wanted to keep going, but you should always follow your child. I presented the material to Peanut, explaining to him that we were going to work on something new. We counted, pointing at each number from 0-4. I counted out the correct number of spindles on the carpet first, and then placed them in the correct tube. So, I counted “1,2” sticks on the carpet before transferring them to the “2” tube. We kept going in this manner until we were finished! Although after about number 2 Peanut wanted to do it, so we did it together all the way up to 9. **A note: If you’re only using the first set of 0-4, remove the extra sticks. You should only enough sticks to fill boxes 0-4. Having no sticks left at the end is part of the control of error, letting the child know the activity has been completed correctly. 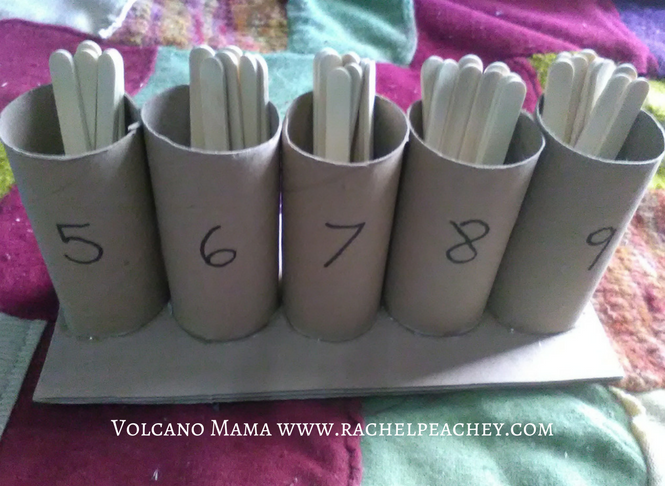 This is another basic Montessori math material that helps children learn to count, the concept that numbers relate to a quantity and recognize numerals. I made my bead set using yarn and beads. The numbers are made from foam paper so that they are easy to pick up and move around. I also highly recommend using felt as a mat for working with the beads so they don’t roll around on the table (if you’re working on a table). How do you present this material? With Peanut, I started out showing him the beads. We counted them in order and in the triangle formation, 1-9. Then, I mixed up the beads and we put them back in order, slowly counting them. 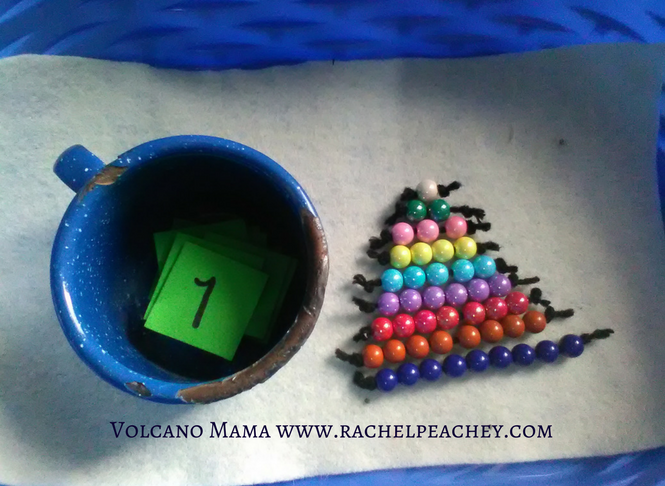 Next, I presented the number cards with the beads, but only from 1-3. 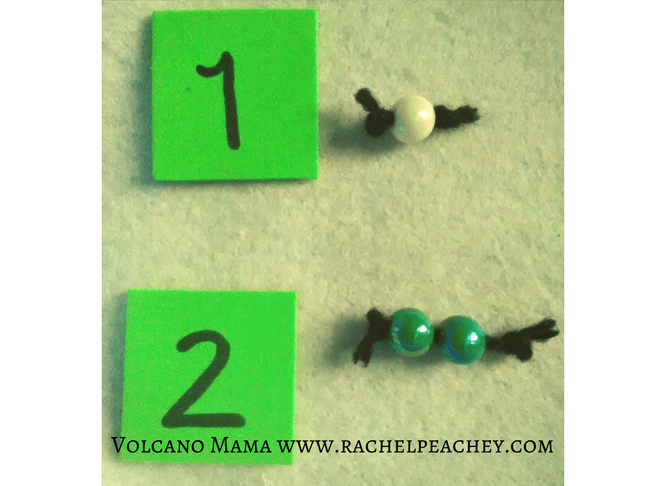 Then, he worked on putting the correct numeral beside each bead chain (as above). I only work with 3 numbers at a time so it’s not too frustrating. I also made some worksheet style extensions to use with the beads. One is a simple sheet showing the bead triangle that he can color using the same colors as the beads. I wrote the numbers in pencil next to each chain so that he could trace the numbers. Someday soon, I’ll get out this addition sheet as well. This will require an extra set of bead chains, and focuses on the concept of adding two quantities together. For this worksheet, the child should recreate the equation shown in beads on the sheet, color the beads and then show the answer. The answer can be either drawn beads or in written numerals. 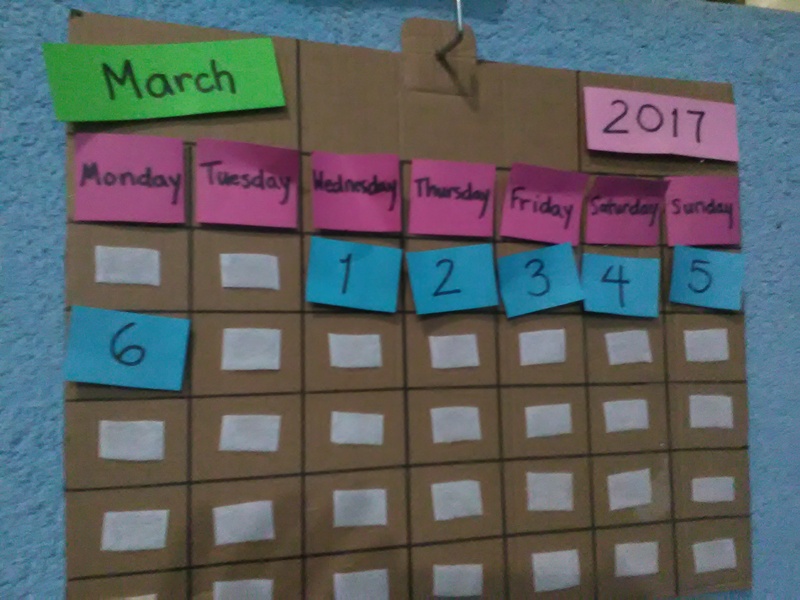 We put up the date on our calendar every day and count how many days of the month have gone by. We count dogs, red cars, motorcycles and anything else that occurs to us while going for walks around town. These are just a few ways we’re incorporating math into our lives. In other homeschool activities, we measure objects and animals (like snakes! 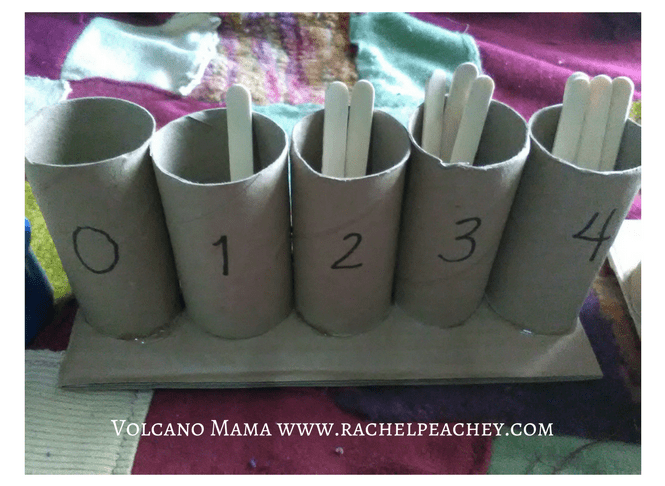 ), which is another great way to incorporate math and keep things multidisciplinary. There are soooo many math materials and things to do with Montessori math. 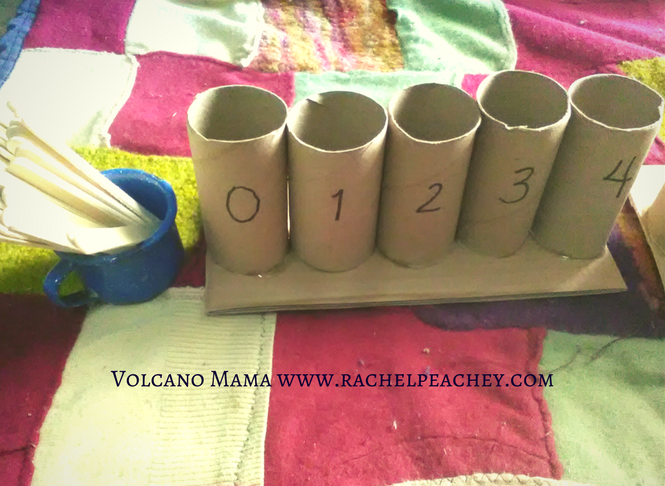 From the addition strip boards to the golden beads, number rods and more, there is a lot of math to do. I’m sure as Peanut develops his interest, I’ll come up with ways to create these materials without breaking the bank. 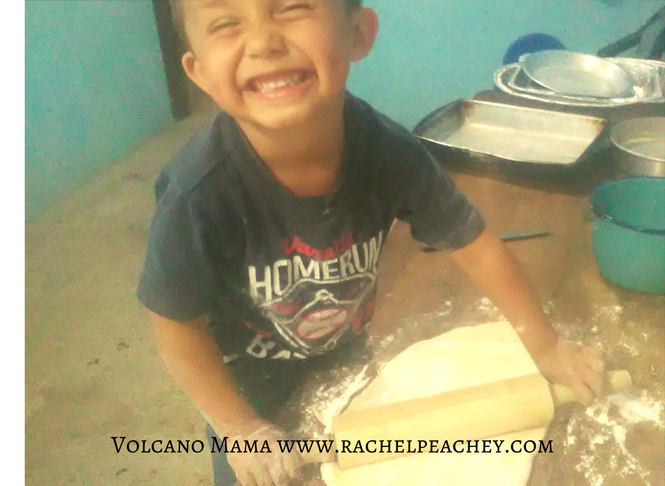 What’s your favorite part about Montessori math for kindergarteners?